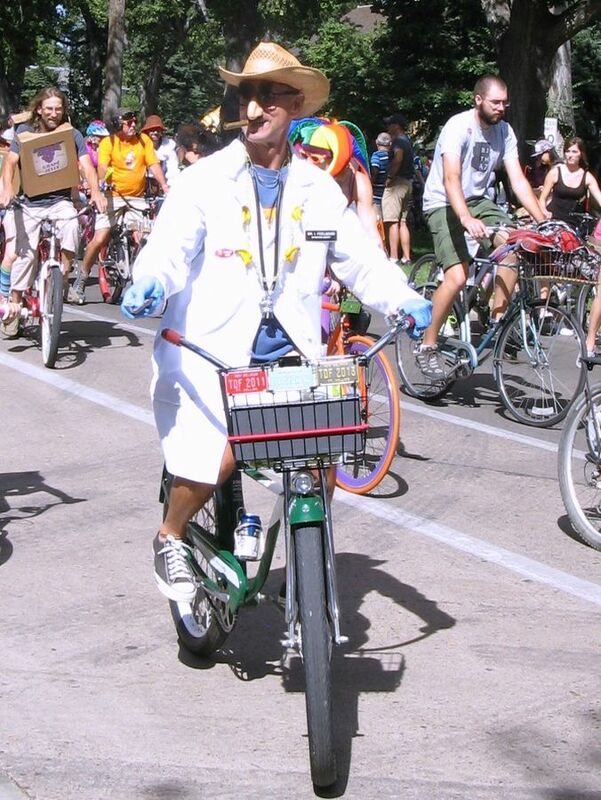 New Belgium Brewing’s Tour de Fat was started to promote cycling. 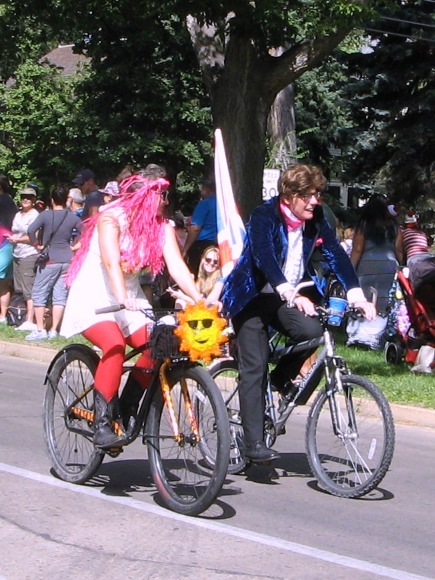 While I loved the wide variety of bikes and the ways people decorated them, the real fun was in seeing everyone, young and old, playing dress up. It was the perfect place to be to get ideas for what to wear this Halloween. Here is a tiny sample of the amazing costumes at the parade. 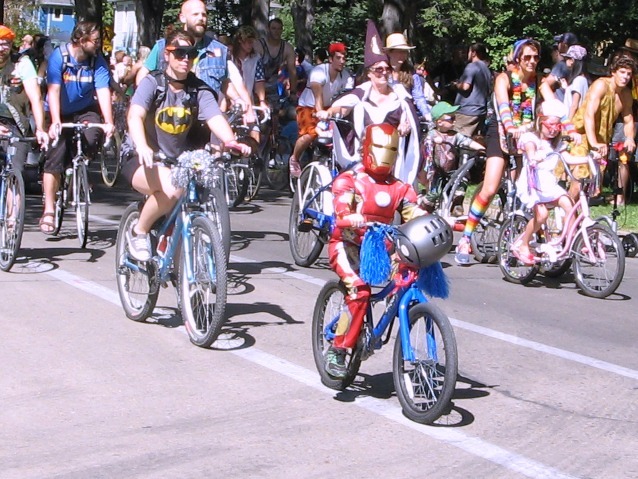 Superheroes came in all sizes, big and small. Other movie heroes, from Braveheart to Austin Powers, were there, too. Braveheart, lighting a fire under the crowd. Costumes I thought of as “generic traditional” were everywhere. 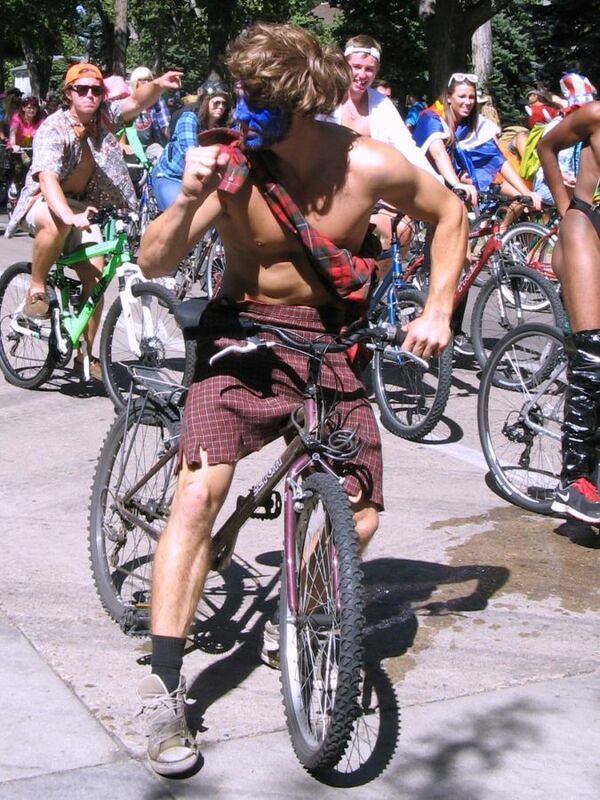 I saw construction crews, fairies, nuns, clowns, hippies, and, of course, pirates. The costumes most in tune with the darker side of Halloween were Day of the Dead skeletons in big sombreros. Group costumes ranged from couples to armies of people. 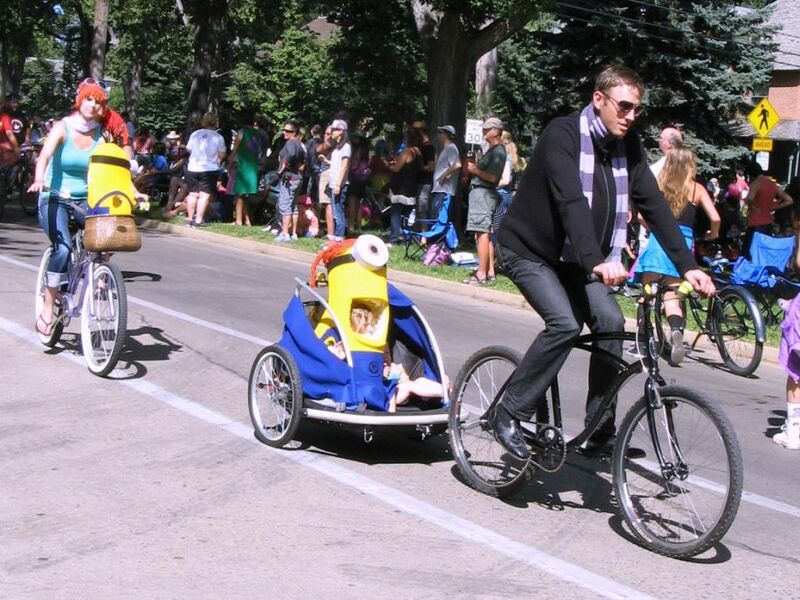 My favorite was the characters from Despicable Me 2. Gru and Lucy with minions. Children’s books were also a source of ideas. I saw George’s friend The Man in the Yellow Hat, the Cat in the Hat, and of course, Thing 1 and Thing 2 (which I thought was a great idea for a couple). 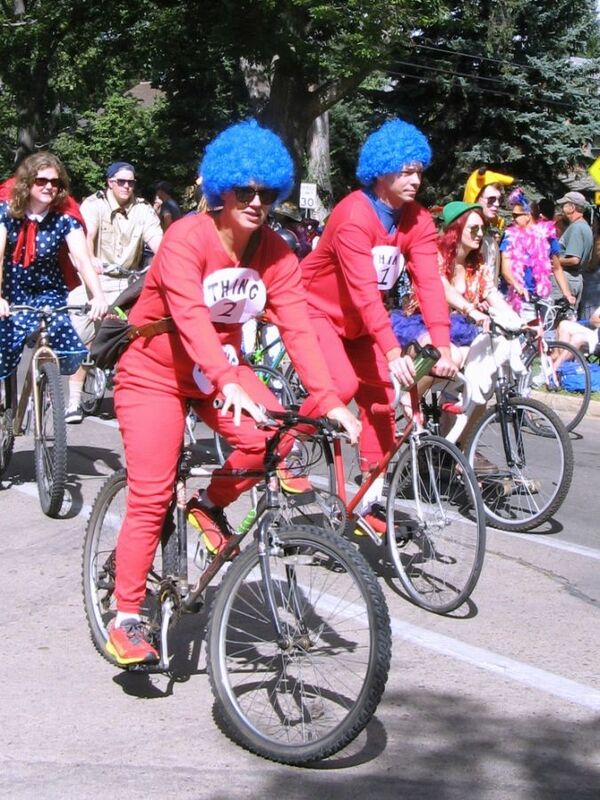 For Dr. Seuss fans: Thing 1 and Thing 2. Everyone has seen renditions of the characters from the Wizard of Oz, but this was the first time I ever saw one of the living trees. I’d turn back if I were you! 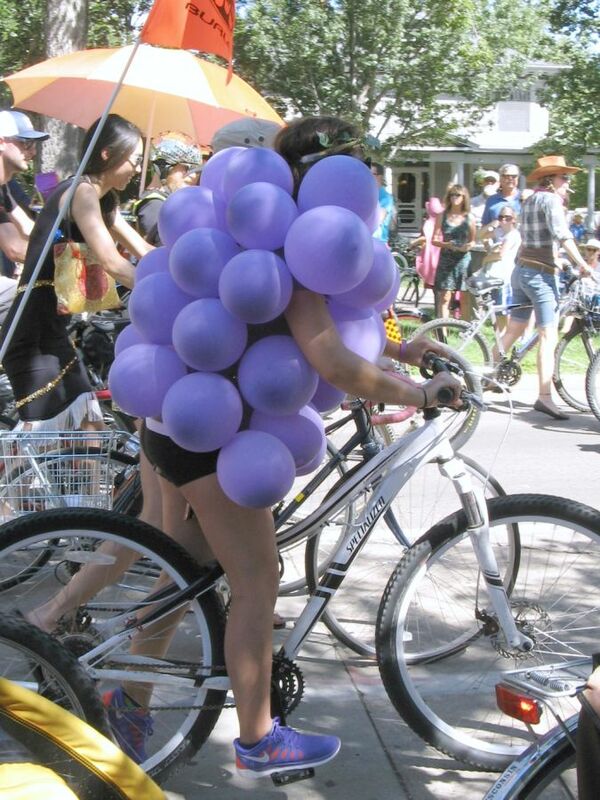 If you need something fast and easy, consider getting some purple balloons and being a bunch of grapes. 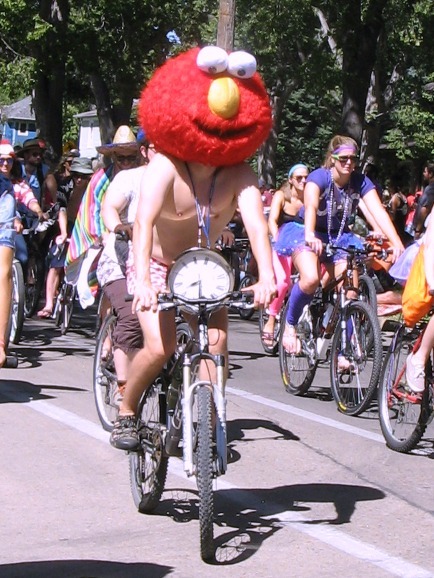 Or get yourself a mask and you can be anyone, even Elmo from the Muppets. A few more props and you can be Elvis, Jesus, or Groucho Marx. For those interested in putting in a little more effort, there were elaborate options on display, like this Tiki totem outfit. Feeling even more ambitious? 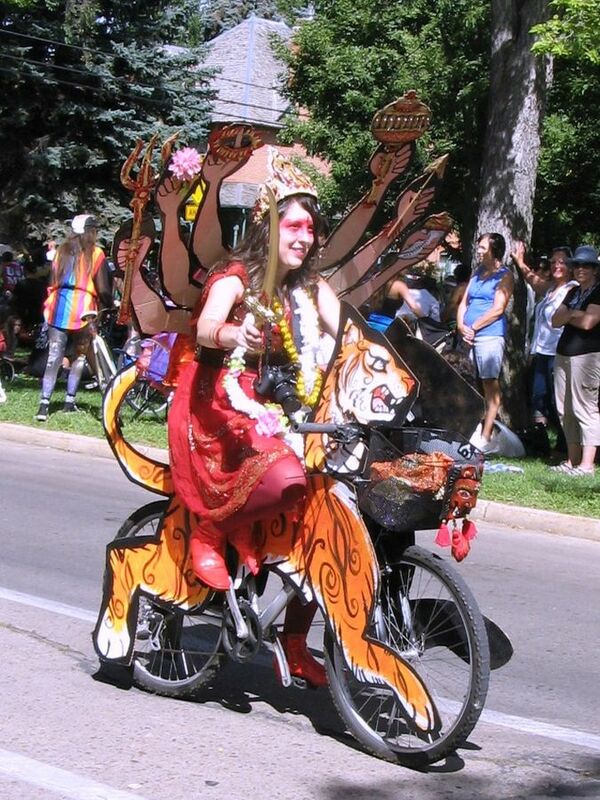 How about going as the Hindu goddess Durga, riding her tiger? Durga on her tiger (and carrying her camera; she knew it was going to be a photo-op kind of day). 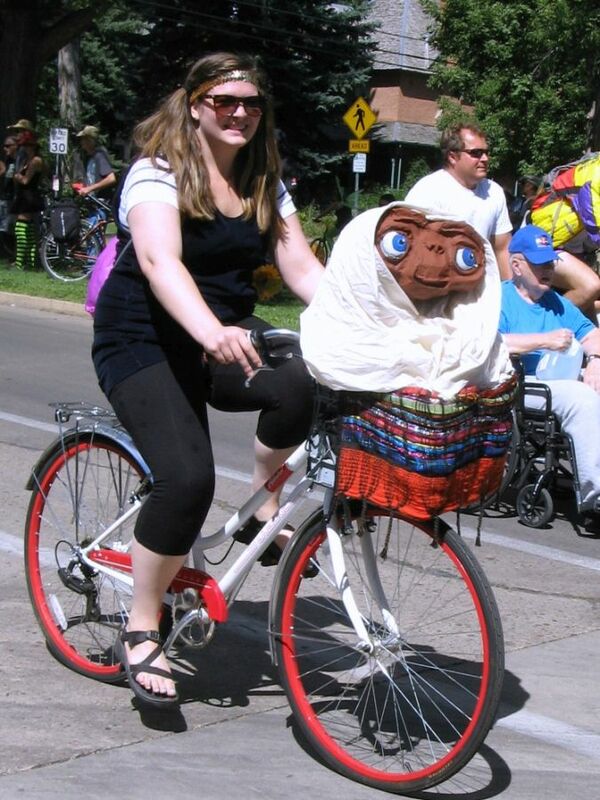 If you’re up for a costume that includes a bike, but want to do something simpler, you can always put ET in your basket. I thought this E.T. 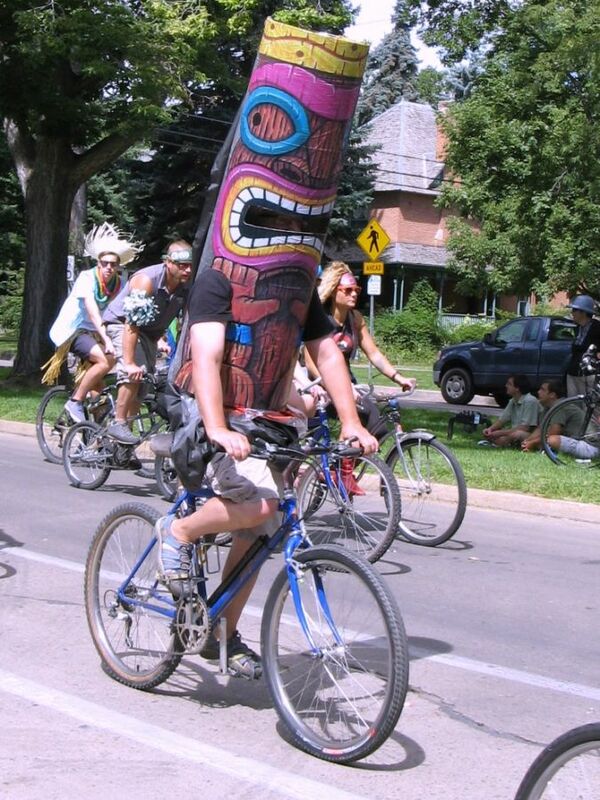 costume was particularly clever for a bicycle parade. You can tell it’s not a Halloween parade. Except for some skeletons and one Mad Max gang, there weren’t many scary costumes to be seen. 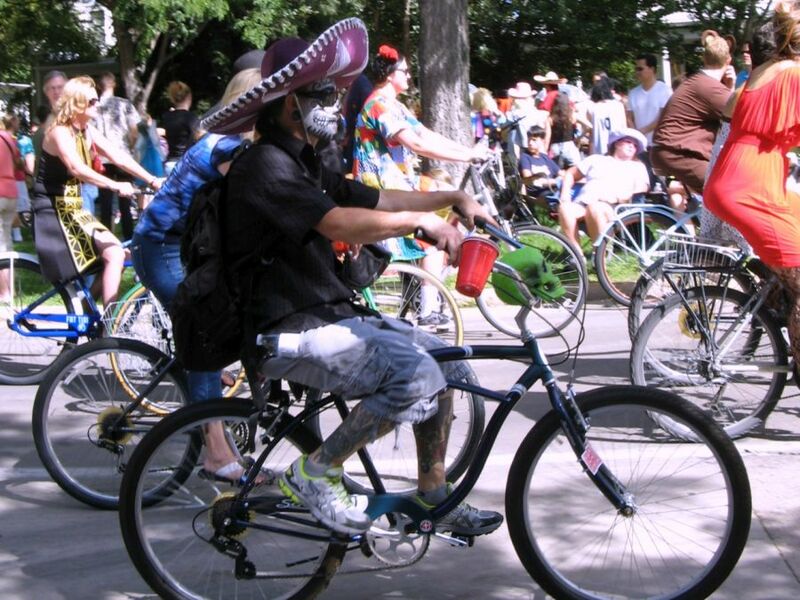 If you’re in the market for costume ideas that aren’t monsters and witches, the Tour de Fat is the place to be. Halloween is almost here. Who will you be this year? Fantastic! But I wonder how some of them actually ride a bike too! 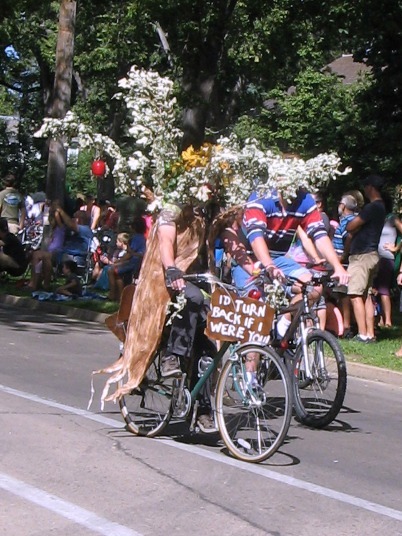 As we watched, we came up with rules we would follow if we were dressing for the parade. Mostly with the heat and the need to pedal in mind. 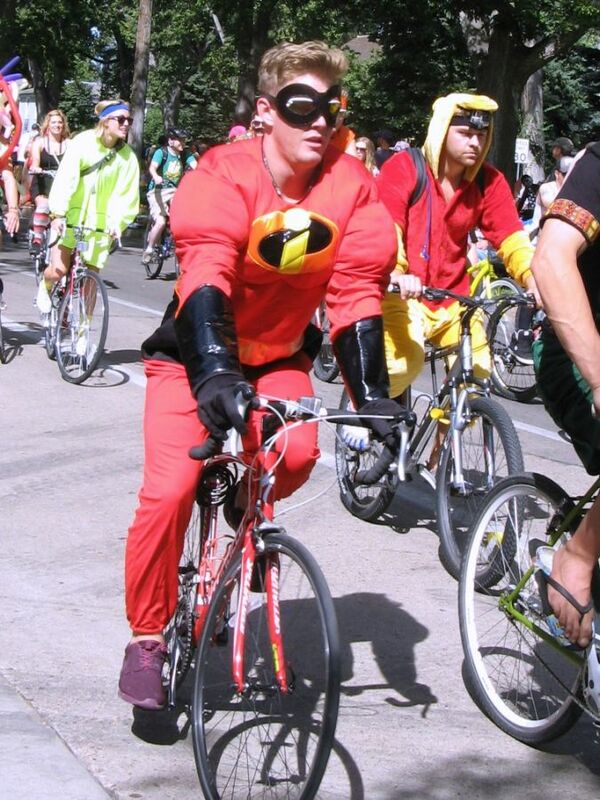 And what would your Superhero on a Bike be?! How about Superman as Clark Kent? That way there’s no cape and the bike makes sense. I love the costumes! They are so creative. And Kit, your comments are great as well (I especially liked the “Jack Sparrow in crocs”). 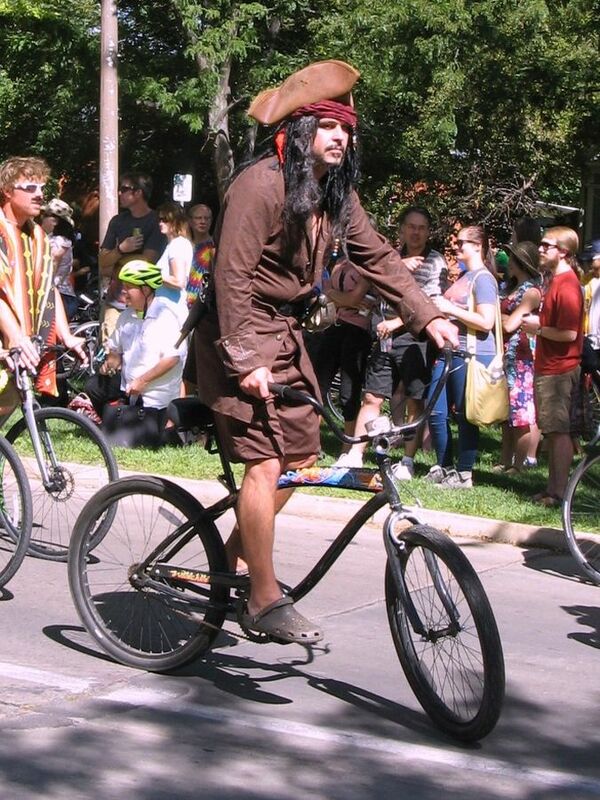 I noticed many of the cyclists had inappropriate foot gear, but the pirate was the most glaring example.